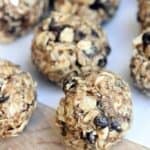 Healthy No-Bake Granola Bites are the perfect, DELICIOUS, on-the-go snack for adults and kids. They’re packed with whole grains and protein to leave you feeling energized and full, longer. I’m sure other mom’s can relate when I say I am constantly on the look-out for healthy snack ideas! And not just for my kids, but for me too! I often turn to this round-up of Healthy Snack Ideas when I’m all out of good ideas. 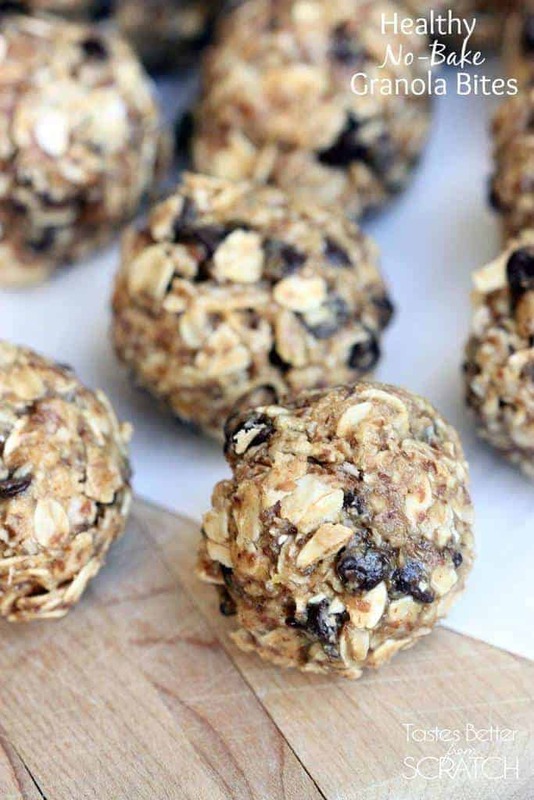 But these no-bake granola bites are our new family favorite! Not only do they take minutes to throw together, I can freeze them and have them on hand for months! Total score. My 2 year-old is allergic to peanuts so I’ll usually set aside half of the recipe for him and add sunflower butter as a substitution for the peanut butter. Everyone in our family loves these–including my husband who often takes one in his lunch! They are the best for on-the-go days too when you barely have time to throw some snacks in your bag on the way out the door. I often play around with the ingredients and add dried fruit or chia seeds too. Feel free to add in your favorite healthy ingredients to make them even yummier! 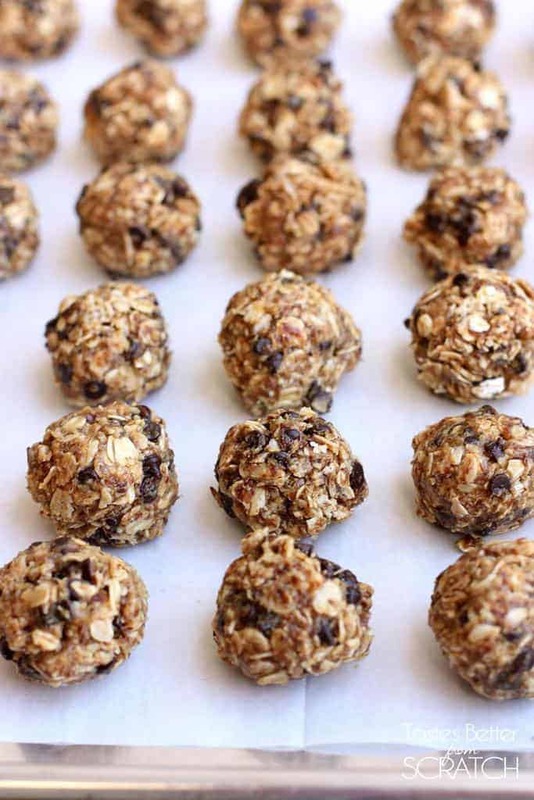 Healthy No-Bake Granola Bites are the perfect on-the-go snack for adults and kids. They're packed with whole grains and protein to leave you feeling energized and full, longer. Using a cookie scoop and your hands, drop rounded tablespoonful-sized portions onto a parchment lined cooking sheet. Refrigerate for 1-2 hours. *You could use whole grain oats, but pulse them in a food processor a few times first. If not you may need to add a little extra peanut butter or honey to the mixture to help them stick together. *One of my kids is allergic to peanuts, so I substitute sunflower butter in his! Made these and they were a hit with kids, hubby and 92 year old mom! Sounds like a win all around! Thanks so much for sharing! It makes about 25 “bites”. 1 serving each. These are delicious! I didn’t have flaxseed on hand, so I substituted hemp hearts and pumpkin seeds (pulsed a few times in blender). The finished product is quite sweet, which my husband and toddler love, but I’ll probably reduce the honey a bit next time I make them. All around, a great recipe that will definitely be repeated at my house. Thanks, Lauren!